With heavy metal music, one of the things that I think is amazing is the variety of music that we as metalheads get to listen to is dynamic and wide ranging. Getting the chance to speak to the creative force behind some of this music is pretty incredible and allows us a bit of a "behind the scenes" look at the creative process that goes into making the music and how it becomes the end product that we receive when the album is finally released. 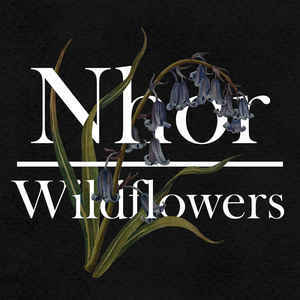 I recently spoke with solo artist Nhor about 'Wildflowers: Spring', an incredibly beautiful release. Come along on the journey of where his ideas spring from, what inspires him and get a glimpse behind the curtains of Nhor. Maximum Metal: Thank you for taking some time to talk with me. Let's dive right in to 'Wildflowers: Spring'. This album is the first of four and I was wondering if you intended for the 'Wildflowers' concept to be a quadrilogy from the get go and how the genesis of the idea for the album and concept came about. Nhor: The beginnings of the idea came to me when listening back to demo recordings of mine. If I ever write music that I think is worth keeping or exploring I tend to record the ideas so I don't forget them. I'm unsure when it was exactly, but at some point I listened back to some of my demo's and noticed a real shift in moods between my recordings. There was a noticeable shift depending on when the demo was recorded, particularly between winter and summer. I thought it would be interesting to actively make something that reflected the seasons in such a way. I began writing with a "seasonal" album in mind, hoping what I wrote through the year would have noticeable differences in moods. I want the listener to experience the music in the seasons that they were written in and for. This naturally led to me dividing the album into 4 parts and releasing them within the seasons themselves. When all 4 seasons have been released, I will then make the album available in full next year to be enjoyed as a whole piece. I hope that people will have memories or feelings they can call upon when listening to each individual season, making that connection to the mood of each season that much stronger. MM: The music on 'Wildflowers: Spring' is just incredibly beautiful. Can you tell me a little bit about the songwriting process for this album and how it differed from the process you used on 'Momentae Quintae Essentiae'? Looking back now it feels as if MQE was a little more difficult to write. I was very conscious then in what I was doing. MQE dealt with removing any ideas, thoughts or feelings I had either actively or accidentally projected onto nature. I was trying to write from a "clear" perspective and portray very specific moments in time. MQE helped me learn to not overthink or tinker too much with ideas. Wildflowers felt very natural to write. I was trying to translate the seasons into music, or more precisely the emotions and moods I experience within each of those seasons, seeing how the season itself affects them. I tend to write at night, it seems to be when I think the clearest, I think this is what gives the somnolent nature to my music. MM: This album has continued a direction of more clean sounding music as opposed to what was on 'Within the Darkness Between the Starlight'. With their being so many genres out there, your music is tagged on Bandcamp under "ambient piano" and "black metal". Would you say those tags are accurate and do you feel your music identifies with a specific genre or just speaks for itself as music without a label being necessary? I don't mind the labeling of music. It's not something I personally use to find new music I like, but for those that do, I completely understand the process. The problem is that I find it very limiting in discovering music that I enjoy. I think one thing to remember is that the way people perceive and appreciate music is subjective, and so the labeling of music is also. I suppose I have released 2 different kinds of music, one based mainly in piano playing, and another which fits somewhere in the gigantic spectrum of metal. They are quite far apart musically, technically and in plenty of other ways I'm sure. I expect tags of my music to contradict themselves for this reason, and if anything it's good to know that they are. All music speaks for itself, and I suppose the fact this question is even here shows that there is limitations to labeling music. MM: Speaking of music, the tracks on 'Wildflowers: Spring' feel more like individual pieces than they do individual songs. Is this what you intend when you are writing a track to have it be a stand-alone piece or is just a natural sort of evolution as the track comes together? It's always a natural evolution of the track itself. I tend to write slow, meandering music. I've never studied music in a technical or theoretical way, which I enjoy because I don't feel like there are any rules. I'm sure some people won't agree with that statement, they may say that understanding music theory lets you create to your full potential by knowing what's available. I tend to write from my head, and that's quite clear, as in, I hear the parts before I've played them, it's then just a case of me translating that across to the piano. MM: Hands down, my favorite track off 'Wildflowers: Spring' is the second track, "I Knelt At The Altar That Lays Atop The Stars". That particular track resonated with me on many different levels. When recording each album, do you structure the track titles to allow the listener to glean the meaning on their own or do you put a little in there to sort of push people in that direction? The titles are purposely left without all of the answers. I think peoples own imaginations shouldn't be ignored. By leaving certain elements open to interpretation, or for people to continue with it themselves makes the whole idea stronger. It's a way for the reader to follow the trial for as long as they wish. With that said, I know the meaning behind them all, they're not purposeful puzzles. Many of the titles are lines taken from short passages or other notes I have written throughout the year. I think my project is stronger when people are allowed to finish the story for themselves. Some people have told me that they find my music uplifting, others find it depressive, I've heard that it's good to walk to, to sleep to. Music is subjective, so hopefully my titles at times give space for peoples' own subjectivity, to find their own meaning, story or idea that they wish to add to my own. MM: With your first several releases, you had included stories specific to each album as well as coming up with the idea of what you wanted the artwork to be for each album. That package was very different, unique and immersive. What lead you to decide to release each album in that manner? Where does your inspiration for the artwork come from and do you realize the artwork before the album it accompanies is completed? The ideas for artwork and music normally come together at the same time. The artwork for Wildflowers influenced the title, but the title also influenced the artwork, so I'm not entirely sure which came first. Because I was creating a seasonal album, I wanted the artwork to reflect those changes. Bluebells are potentially my favourite wildflower, and marks one of, if not my favourite time of year. So that was an easy decision to make for artwork. Wildflowers are stunning, revealing themselves from the Earth for such fleeting spells. Their appearance defines the season. I couldn't think of a better way to concisely reflect the seasons than with their image. The black background was also very important. The majority of botanical artwork is on white paper. White for this album would not have fit as the music was almost solely written in the night. The black background quietens the whole mood of the artwork and I think comes to reflect my music and it's moods much better. MM: I think that the idea of the stories accompanying the albums is a very cool thing. Do you feel that music is required to have visual imagery with it and that album covers are necessary to convey the mood? Also, can listeners get the theme of each album without any of the accompanying artwork? I think including artwork/imagery with music is very important, but not necessary. A smell can conjure memories that allow you to relive other emotions/states/sensations. I feel that music and artwork can do the same thing. If I have been listening to an album consistently while reading a book, both will now remind me of each other. Artwork for albums can become iconic, it can become a symbol for ideals and emotions. I do think listeners would gather the theme of my music without artwork, but I don't think it would be as well developed or as detailed. For my previous album I included incense that I had hand made for the purpose of including another sense to my album. I named the incense "A Fire Of Wildflowers", which should indicate what direction I was headed in even at that time. I wanted it to smell like the title. I wanted those who live in cities to be able to find another sense to put them closer to where I write my music and what inspires me. MM: Back to the stories that were part of your first several releases, did you have the ideas for the stories already and then build the album around those ideas or was it the other way around or something totally different? The stories come together just like the artwork; usually from an idea or theme that's linked with the music. It's hard for me to talk about them without potentially spoiling the stories for anyone who wishes to read them in the future. The stories tend to be created when I walk. I remember the story for "Within The Darkness Between The Starlight" being formulated on a very long walk. Some of my first stories were based around inventing meanings, or reasons for objects or occurrences in nature, from morning dew, to the very first tree. I have others that I haven't yet released. Although, one has potential to be released as a very unique edition in the future. MM: You have been recording and making music for 8 years now. When you first began creating music, where did you see yourself going and was there ever any plan to bring anyone else in to work on the music with your or was it always envisioned as a solo project? In your own words, how would you explain how your sound has evolved from the inception of the project to present time? My first album was actually a collection of my favourite songs. I had many ideas and short pieces that I had created over some length of time. I was encouraged to record them, and so after considering my favourites, I came to record the first album. There was never a direction to head in and there still isn't. I write music when I feel compelled to. I don't write because I feel I have to, or that it's time to put another album out. This project is for myself, it's something I have done for years and something I will continue to do as inspiration guides me. It started as a project of discovery, to find out who, where and what I was. I think we all continue on this journey whether we know it or not. I don't see the need to include anyone else. It's not that I am actively against it, it's just that I'm creating personal music that is a natural product of my own mind and emotions. There is no real way for me to work with someone else that doesn't affect this. "I owe everything I have created to the universe." I owe everything I have created to the universe. I owe it to the stars and planets, to the Moon and the Earth, to the wind and the rain. To the forest and it's creatures, everything I have is borrowed from them. My music is but a poor interpretation of their song and my imagination is but a diluted replica of Mother Natures. MM: When you release an album or an EP, what is your thought process when the album gets reviewed? Are reviews something that you are interested in reading or do you feel that the music speaks for itself and since reviews can be very subjective that how someone interprets the album is just their interpretation and not a reflection on the music as a whole? Yes reviews are subjective, but for me, as someone who's created the music, that makes for an even more interesting read. If music was fact based, I wouldn't need to read the facts on my music as I'm sure I'd know them already. As it is subjective, the reviews are a way for me to understand how others perceive my music, and if what I felt when writing the music is shared by anyone else. MM: With so many artists turning to Bandcamp to make their music available, what do you feel the draw is for utilizing a site like Bandcamp vs. using a record label, be it large or small, to get your music out in to the world? I think both elements are important. A record label can be a seal of approval in one sense. There is so much music out there, a record label in my eyes is a better version of labeling music. Prophecy for instance features a lot of bands and artists who aren't the same as Nhor, but may have certain elements that people will enjoy if they like my project. The same goes for a lot of other record labels out there. They help in many ways and allow an artist to create things and take part in things where they might not have been able to before. Bandcamp is a great way for anyone to make their music available to the whole world. There's no need to worry about printings costs, postage costs etc. That is obviously a very powerful tool. Being able to instantly play your song to anyone in the world is incredible. MM: I just wanted to thank you again for taking the time to speak with me and to also thank you for creating and sharing such wonderful music. It is truly wonderful and I am very much looking forward to seeing what the next installment of 'Wildflowers' holds. This space is yours to say whatever you would like about anything you would like. Thank you again for your time and best wishes to you in all that you do. Thank you for all of your kind words and for supporting my project. I mentioned about writing short passages and other notes through the year. turning the lake into the night's mirror. Nhor Greg Watson 9/13/2017 "Credit the Universe"